Have you ever noticed that conversation topics tend to occur in bunches? This week the conversation of choice seems to be can small and mid-market business hire salespeople successfully? I met with the CEO of a great services business and he's clearly in the camp of you can't. His story is not unique. He's been the primary salesperson for his company from its inception. He's tried hiring salespeople in the past. It never worked out. He's come to believe that you just can't hire salespeople successfully. Many statistics and studies would support my new friend. Just recently I shared a devastating study on the effectiveness of salespeople that was conducted by The Harvard Business Review. Recruiters that I talk with tell me that the mis-hire rate for salespeople for small and mid-market companies is 75 - 85%! One of the best all purpose recruiters I know won't even engage in a sales search. But, I've got to tell you I just don't buy it. I think small and mid-market business can successfully hire salespeople. They just need to understand what it is they are hiring. There are two fundamental mistakes small and mid-market companies make when hiring/building a sales effort. They treat the "salesperson issue" as a people problem, when it is, in fact, a system problem. You must fix the system first. They view "sales" and "selling" through singular definition when it actually means very different things. 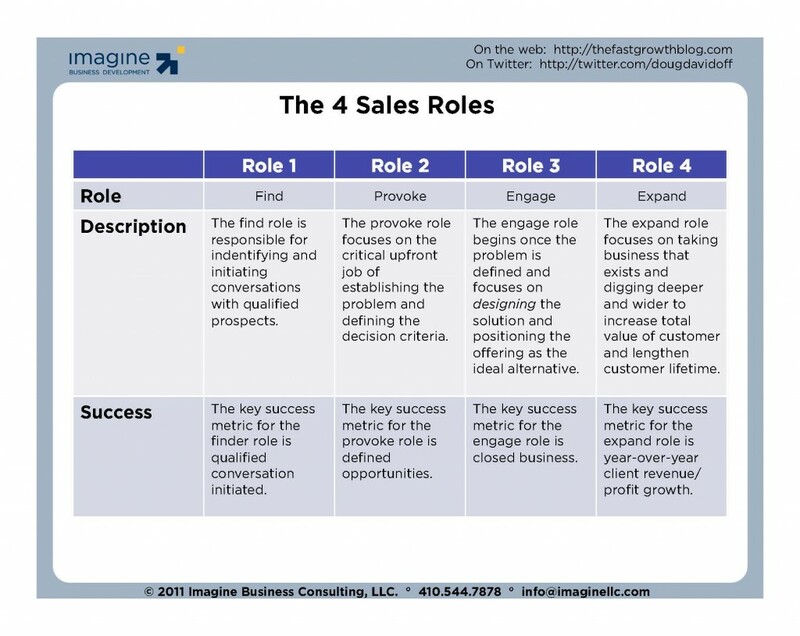 As the chart below shows, there are four distinct roles in selling. Each role requires different strengths, different focus, different measurements. The priorities for each role are different, and oftentimes conflict. There is simply no way you can find someone to effectively fill all four roles. When they try, they just end up treading water and wasting company resources. If you're thinking about hiring a salesperson, take a moment and define which role you are really hiring - then focus on filling that role and build the others later. Have you solved the sales hiring challenge? What do you do?